Mozilla has just released Firefox 3 Release Candidate 1 and the final release is just around the corner. I really think that this is an awesome product, and wanted to mention my two biggest reasons for why that is. The great thing about this interface is that it requires zero effort to find and take advantage of; everyone uses the URL bar, and will eventually discover the usefulness of this feature when the suggestion list gives them what they want before they’re done asking for it. The screenshots above are from Deb Richardson’s excellent blog post detailing the feature, entitled AwesomeBar is awesome. The great thing is that this kind of functionality is only going to improve over time, because the Mozilla design team understands the power of the graphical keyboard user interface. This is the simplest UI change in the world, but I’m grateful for it day after day. It’s amazing how much less frustrating this one modification has made my browsing experience. 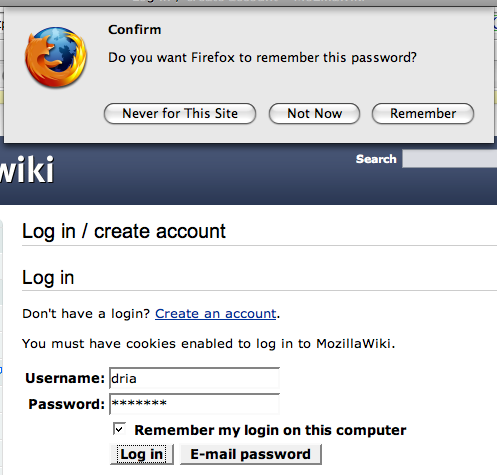 These pictures, too, were stolen from Deb’s blog, this time from her article on Firefox 3 password management. Of course, there’s plenty of other features in Firefox 3 that make the browsing experience more humane and improve its safety, but these are my two favorites. They’re bound to differ from one person to another, of course, and I hope that everyone I know will get a chance to try this awesome product for themselves.